You sure know how frustrating it is to have deadlines that are pushed. Being pushed to get a certificate before a bid is due just makes it worse. 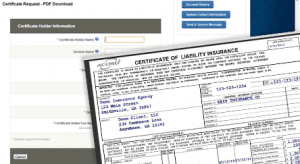 AgencyEagle has a solution for your insurance company to make this process easy. The solution is our CAROL online self service system. The insurance agent has the ability to setup your business for this service and still control the certificate.